The Cobra petrol scarifier has been designed in the UK to cater specifically for the changing conditions of the British lawn. It has a powerful and reliable 135cc Honda GC Series engine. With it's 38cm working width, it will make short work of your lawn care, effortlessly removing moss and thatch from your lawn, and storing it in it's large 45 litre collection bag. 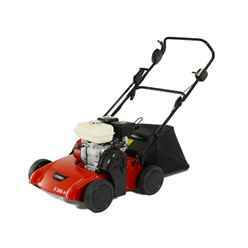 This is a quality petrol scarifier which is tremendous value at more than half the price of it's similar specification competitors.